Lawyers to a former Bank PHB boss, Francis Atuche, on Thursday dismissed allegation by the Economic and Financial Crimes Commission that one of its witnesses received threats to his life. 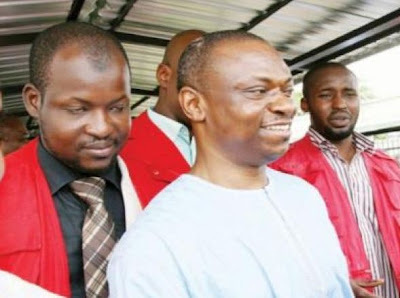 The News Agency of Nigeria (NAN) reports that Atuche, the bank’s former Managing Director, is being prosecuted before Justice Lateefat Okunnu of a Lagos High Court in Ikeja. He was charged to court alongside his wife, Elizabeth and a former Chief Financial Officer of the bank, Ugo Anyanwu, for alleged stealing. The commission alleged that they stole over N25.7 billion belonging to Bank PHB (now KeyStone Bank) between Nov. 2007 and April 2008. During Thursday’s proceedings, EFCC counsel, Mr Adebowale Kamoru, informed the court that the witness, Mr Bolaji Ogunsola, had sent an e-mail to the commission alleging that his life was being threatened. Ogunsola, a former managing director of Mortgages PHB Ltd, a subsidiary of Bank PHB, had on Sept. 26 testified against the defendants. Kamoru said the witness had gone into hiding following the alleged threat, stressing that all efforts by the EFCC to convince him to appear before the court had proved futile. He said: “The appropriate law enforcement agencies have been informed of the development. “Necessary steps are being taken to ensure that adequate security is put in place throughout the period he will appear before the court on this matter”. Kamoru said the witness would continue his testimony when the security arrangement was in place and therefore, sought an adjournment. Responding, counsel to the Atuches, Chief Anthony Idigbe (SAN), said the allegation was baseless, noting that it was aimed at portraying the defendants in bad light before the court. He said:”I am completely shocked by the comments of prosecution counsel. “In the e-mail, the witness did not indicate where and on whom those threats might have come from. “But having expressed it in open court, there is an inference perhaps that the defendants are responsible for the alleged threat”. Idigbe said 15 witnesses had already testified before the court on behalf of the prosecution, stressing that none of them had made such allegations against the defendants. He, therefore, urged the court to order police protection for Ogunsola, so that he could appear for his cross-examination. Counsel to Anyanwu, Mr Silva Ogwemoh, also condemned the allegation against the defendants. Ogwemoh said he was shown a half-torn paper by the EFCC counsel, which was the purported e-mail received by the witness. He said:” We have shown that we are prepared to conduct our defence. Nobody has been threatened and we will not do so for any reason. “We are indeed taken aback and we are very sad with this development”.